A teenager has told how to be secretly got vaccinated against the wishes of his parents, which he claimed believed to be debunked anti-vaccine "conspiracy theories", they read on the internet. 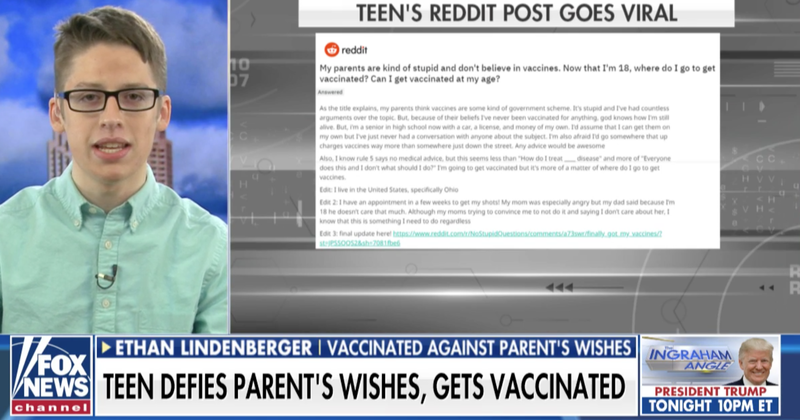 Ethan Lindenberger, 18, appealed for help on a Reddit forum, asking which vaccines he should obtain, as he said he had never received any, because "my parents are kind of stupid and do not believe in vaccines". "God knows how I'm still alive," he wrote. After reading the advice, and consulting with a pastor, the teenager last December walked into a department of heath office in Norwalk, Ohio, and obtained vaccines for hepatitis A , hepatitis B, influenza and HPV. As a child he missed out on receiving the measles, mumps, and rubella (MMR) vaccine, that most states demand children have to attend school, and which the Centers for Disease Control and Prevention recommends is given in two doses. "The United States' long-standing vaccine safety program closely and constantly monitors the safety of vaccines," it says. The teenager said he sought to try and show the information to his mother, Jill Wheeler, who had her first two children vaccinated, until she found she could opt them out. "Her response was simply 'that's what they want you to think'," he told NPR. "I was just blown away that you know, the largest health organization in the whole world would be written off with a kind of conspiracy theory-like statement like that." He said his mother was influenced by the debunked and disgraced former British doctor, Andrew Wakefield, who in the 1990s claimed there was a possible link between the MMR vaccine and childhood developmental regression and autism. The paper he co-authored was removed by The Lancet and he was found guilty of professional misconduct after a series of media exposes led to formal investigations. Mr Wakefield has since remade himself in the US, where Donald Trump is among those who believe there is a link between vaccines and autism, despite the conclusions of this own government's scientists. Mr Wakefield was among four leading anti-vaccination campaigners who met the Republican candidate at a 2016 fundraiser in Florida shortly before the election. The 62-year-old, who in 2017 was linked to an outbreak of measles among the Somali American community in Minnesota after he visited and shared his views with them, last year told The Independent : " I was discredited in the eyes of those who wanted to see me discredited. In other words, those who had an interest in maintaining the status quo. " Asked if he still believed there was a link, he said:" Is there a real case to answer? Absolutely. Do I believe vaccines cause autism? Yes I do. Is the problem equally as large in the US? Yes it is. " The vast majority of experts in the field say Mr Wakefield is wrong and point to as many as 17 studies showing no link between autism and the MMR vaccine. Neither Mr Lindenberger or his mother could be immediately contacted on Monday. She told undark.Org her son's actions felt left a "slap in the face". "It was like him spitting on me, saying 'You do not know anything, I do not trust you with anything. You do not know what you're talking about. You did make a bad decision and I'm gonna go fix it ', "she said. The actions of Mr Lindenberger come as Washington state has declared a public emergency following an outbreak of measles in southern Clark County that has infected at least 53 people, mostly children. Another four cases have been confirmed in neighboring Multnomah County, Oregon. Another case has been identified in King County, which includes Seattle. Both Washington and Oregon are among 17 states that permit children to go to school unvaccinated because of personal beliefs. Both state legislatures said to be considering changes to those laws. One report said one-in-four youngsters attending kindergarten in Washington, have not been vaccinated.